In May of 2006, a Mexican kid with a potty mouth and a strong regiomontano accent took the world by storm with his infamous YouTube video that recorded his fall for posterity. In late 2009, his fame is yet to subside. 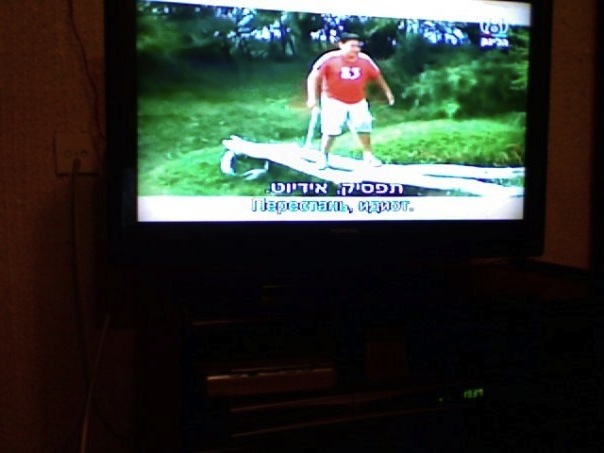 The MKX® correspondent in Tel Aviv, Amit Safir, sends the photo above, showing Edgar “El que se cae” (“The one who falls”) starring in Israeli TV. You can tell because of the Hebrew and Russian subtitles. As our multilingual readers can attest, there is no good direct translation for his trademark phrase “¡Ya güey!‘. The MKX has covered Edgar before.